A manhunt is under way for an Iraq war veteran wanted in connection with the murder of a female ranger at Mount Rainier National Park in Washington state. Mount Rainier National Park was closed after ranger Margaret Anderson, 34, was shot dead after she set up a roadblock to try and stop the suspect’s vehicle. The suspect, named locally as Benjamin Colton Barnes, 24, is also wanted in connection with an earlier shooting. 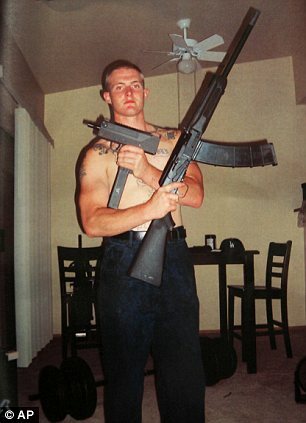 Benjamin Colton Barnes is reported to be an Iraq war veteran with survivalist skills. Police said they had recovered his vehicle, which had weapons and body armour inside. The shooting happened as hikers and climbers flocked to enjoy the park’s wooded trails and spectacular views of the 14,410 ft (4,392m) Mount Rainier on an unseasonably mild New Year’s holiday. The park was immediately closed after the shooting, and around 85 visitors and 15 park staff were moved into a visitors’ centre to wait for police to give them the all-clear to leave. Police said Benjamin Colton Barnes was wanted for questioning over an early-morning shooting at a New Year’s party in Skyway, just south of Seattle, which left four people injured. The King County Sheriff’s Office quoted witnesses as saying multiple people at the party were armed and a shoot-out had erupted following an argument over a weapon. Margaret Anderson and a fellow ranger set up a roadblock after the suspect failed to stop at a tyre-assessment checkpoint at around 10:20 local time on Sunday, a spokesman for the national park said. Both rangers were fired on, but only Margaret Anderson – a mother of two young daughters and married to another of the park’s rangers – was hit. “It’s just a huge tragedy – for the family, the park and the park service,” park superintendent Randy King said. The park will remain closed on Monday while the search continues through its 368 sq miles of terrain.